US President Donald Trump says he is being investigated by the "US Deep State" because he is trying to improve his nation's bilateral relations with Russia. Pakistan's ex Prime Minister Nawaz Sharif has also made similar allegations of being targeted by "Khalai Makhlooq" (Pakistani Deep State) because of his efforts to make peace with India. Their narratives are strikingly similar. Sharif and Trump have polarized and divided their nations by asking their political supporters to stand by them and to reject what they describe as a political "witch hunt". In a press conference after meeting with Russian President Vladimir Putin in Helsinki, Mr. Trump said: "We have 90 percent of nuclear power between the two countries. It’s ridiculous. It’s ridiculous what’s going on with the probe". The probe Mr. Trump is calling "ridiculous" is the result of the consensus reached by US intelligence agencies that Russia meddled in 2016 US presidential election to help Mr. Trump win. President Putin confessed that he favored Trump over Democrat Hillary Clinton. Trump's supporters have accused "US Deep State" made up of intelligence and security establishment and Democrats of pursuing an anti-Trump agenda to derail efforts to improve US-Russia ties. Trump himself at the Helsinki press conference said: "As president, I cannot make decisions on foreign policy in a futile effort to appease partisan critics or the media or Democrats who want to do nothing but resist and obstruct. Constructive dialogue between the United States and Russia forwards the opportunity to open new pathways toward peace and stability in our world. I would rather take a political risk in pursuit of peace than to risk peace in pursuit of politics. As president, I will always put what is best for America and what is best for the American people". Nawaz Sharif and his supporters have long accused "Khalai Makhlooq" (Pakistani Deep State) for targeting him because of his efforts to improve ties with India. They reject any criticism of Sharif's eagerness to make friends with Indian Hindu Nationalist Prime Minister while ignoring India's proxy war of terror to destabilize and damage Pakistan. Sharif's critics say that he is too soft on India's Modi in the same way that Trump's critics accuse him of being too cosy with Russia's Vladimir Putin. They cite Nawaz Sharif's total silence on the arrest and confessions of Indian intelligence agent Kulbhushan Jadhav in Balochistan. Sharif's silence on this issue is seen as his distrust in his own intelligence agencies. Sharif and his supporters have bought the Indian narrative that Pakistani establishment is the root cause of all problems between India and Pakistan. It''s similar to the way Trump and his supporters accuse US establishment of being responsible for lack of progress on building better ties with Russia. In 2009 Sharm al Sheikh meeting between then prime ministers Yousuf Raza Gilani and Manmohan Singh, the joint declaration included the mention of India's involvement in Balochistan along with Kashmir and other issues. In 2015 when Nawaz Sharif met with Narendra Modi in Ufa, Russia, the joint statement does not mention the the Kashmir issue. Nor did it raise the issue of the 2007 inquiry of the Samjhauta Express blast, the British government’s alleged findings that India was supporting the MQM, and the Pakistan's charge that India is supporting terrorist groups in Pakistan. The difference between the Sharm al Sheikh and Ufa caught the attention of all in Pakistan and reinforced the perception that Sharif was eager to make any deal with Modi, even a deal that ignored Pakistan's national security interests. Many Americans have similar views about Trump's eagerness to make a deal with Putin. "This absence of nuance in Western academic writing and commentaries on Pakistan is not just a blind spot. It is deliberate neglect whereby the dominant characterization of Pakistan’s civil–military relations is constructed to suit Western political interests that include aligning Pakistan’s national security policies with that of the West, and having a strong check on its nuclear program. Through aiding the civil–military divide in the country, the idea is to push back the mighty role of the Pakistan army from national security and foreign policy in hopes to seeking concession from the civilian political leadership." On Sharif's eagerness to seek better ties with India, Husain Nadim says that "(Pakistani) military leaders advised caution and small steps to achieving sustainable peace with India — advice which Sharif ignored. After several months of futile attempts to court Indian Prime Minister Narendra Modi, who pressed hard on Pakistan after his rise to power, Sharif faced an embarrassing situation. He accepted that his strategy had been a failure and allowed the military to devise a new strategy to engage India". In “How India Sees the World: Kautilya to the 21st Century”, the former India Foreign Secretary Shyam Saran recalls the crucial meeting of the CCS (Cabinet Committee on Security) on the eve of India-Pakistan Defense Secretary-level talks in May 2006, where the draft agreement, that had been approved by the Army and other stakeholders, was to be discussed. However, he said two key players, the-then National Security Advisor MK Narayanan and then Army Chief General J.J. Singh made last minute interventions to scuttle the proposal, according to a report in The Hindu newspaper. “When the CCS meeting was held on the eve of the defense secretary–level talks, [Mr.] Narayanan launched into a bitter offensive against the proposal, saying that Pakistan could not be trusted, that there would be political and public opposition to any such initiative and that India’s military position in the northern sector vis- à-vis both Pakistan and China would be compromised. [Gen] J.J. Singh, who had happily gone along with the proposal in its earlier iterations, now decided to join Narayanan in rubbishing it,” Mr. Saran writes. The above quote is from A.S. Dulat who has served as Chief of India's Research and Analysis Wing (RAW) and as Special Director of India's Intelligence Bureau. He was speaking with Indian Journalist Karan Thapar of India Today on a variety of subjects including Kashmir and Musharraf-Vajpayee Agra summit. Dulat has essentially confirmed the fact that Indian hawks like the BJP leader L.K. Advani are responsible for sabotaging the India-Pakistan summit. There have now been multiple revelations by former Indian officials like Shyam Saran and AS Dulat as well as leaked US diplomatic cables detailing the causes of failures to resolve disputes in India-Pakistan talks in the last two decades. These disclosures thoroughly debunk the myth promoted by Indian security analysts, Indian politicians and some western think tanks blaming Pakistan, particularly the Pakistani military, for the continuing failures to resolve bilateral disputes with India. 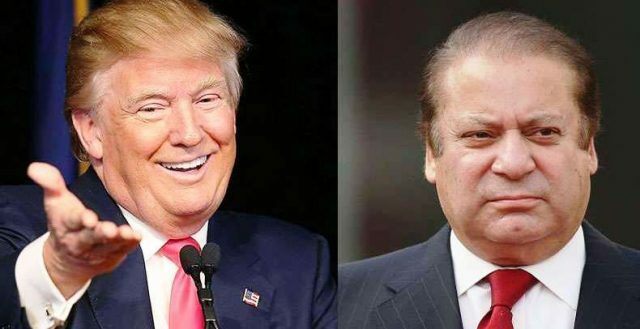 US President Donald Trump and Pakistan's ex prime minister Nawaz Sharif are both claiming they are victims of conspiracies by "Deep State" also known as Khalai Makhlooq in their respective countries. Each says that they are being targeted for wanting better relations with the leaders of their arch rivals in Russia and India. Their narratives are strikingly similar. Sharif and Trump have polarized and divided their own nations by asking the voters to stand by them and to reject what they describe as a political "witch hunt". Their critics argue that both leaders are too eager to make any deals with the enemies, even deals that do not take into account their countries best interests. 1. Pakistan Army and ISI colluded with the international consortium of investigative journalists to hack and leak Panama Papers. 2. They made sure that Nawaz Sharif's family's undeclared assets are part of the leak. 3. Pakistan Army chief and ISI ordered NAB to investigate Panama leak and Nawaz Sharif family's assets. 4. Pakistan Army Chief and ISI chief called a meeting of the top Supreme Court judges to hear the case, remove Nawaz Sharif and transfer trial to a NAB court. 5. Pakistan Army Chief and ISI ordered NAB court to render a guilty verdict. I know it's true. I don't need any evidence for it. BBC Hardtalk's host Stephen Sackur challenged Pakistan Dawn Media Group's CEO Hameed Haroon to show evidence of Pakistani "Deep State" interference in the upcoming elections. Haroon responded by saying there's strong perception of it and said "it's all over social media". Sackur then told Haroon about the widely held view that Dawn Media Group is openly taking sides by supporting PMLN for the last two years and its now "convicted" leader Nawaz Sharif. Sackur: Where is your evidence of orchestration? When I refused to allow this State Department lawyer to participate in a briefing for which his security clearance was insufficient, he immediately called Clinton Chief of Staff and fixer Cheryl Mills to demand entrance to the meeting. His real purpose was to intimidate witnesses from being candid with a congressman. Spying is just one trick up the sleeves of politicized bureaucrats. Powerful senior staffers with authority to classify, resist disclosure, and subvert oversight have perfected other strategies to avoid transparency and accountability. The Deep State manipulates congressional investigations by pretending to cooperate with document subpoenas. Those who are part of the Deep State bury congressional committees in piles of paper ostensibly responsive to the investigation, and then brag to the media about the number of pages they have turned over. The media then dutifully report that the agency has turned over thousands of pages – yet the public gets no answers. Meanwhile, the documents that would actually tell the American people the truth never see the light of day.